NOTE: If you’re just joining us, this is the 4th installment in a series of “Moments,” selected at random from the “journey of a raindrop,” the road trip of a lifetime. 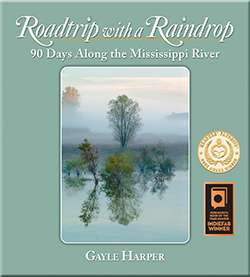 I’m a travel photographer and writer in love with the Mississippi River, so when I learned that it takes a single drop of water 90 days to travel the entire Mississippi River from its headwaters in Minnesota to the Gulf of Mexico, I knew that I would make this journey. For 90 days, I kept pace with my imaginary raindrop, wandering back roads, meeting amazing people and having days filled with crazy, wonderful, serendipitous experiences. As the book of photographs and tales is being produced, I’m sharing these travel moments with you here. I hope you enjoy! As a group, Minnesotans seem to be an active bunch – hiking, biking, roller blading, running. I’m sure some of it is that they like to feel fit, but I’m also convinced some is that they know that if they stop moving the mosquitoes will eat them alive! Even with bug spray, the little buggers think this photographer who stands still long enough for them to land is one big all-you-can-eat buffet!